I have some years (from 2003 to 2006) experimenting with what has been called “video feedbacks“. 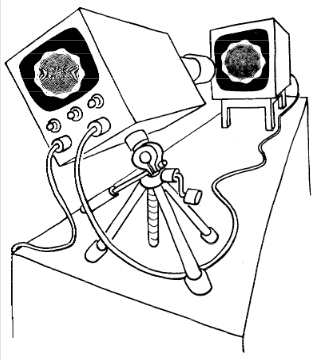 An example of a set-up for video feedbacks taken from the great paper of James Crutchfield entitled “Space-time dynamics in video feedbacks” (1984). Some of them became part of the set for the concerts of Elettrofandango, some got lost, others part of aborted projects. Recently I was able to rescue some of these experiments. Here a collection of some of them as Gifs.